Because storytelling is how we learn things about people who are not like us. It doesn’t matter what kind of book it is. If a story is good, it’s honest, and that means it reveals something about humanity. There’s some kind of saying about readers living a thousand lives—I think it’s from A Game of Thrones, actually. I really believe that. I think it fosters empathy, too, which we could use a lot more of in the world. I’m actually not very good at reading. I used to read a lot more than I do now. My attention span is so small that I struggle with focus. I like reading screenplays because they’re 110 pages usually, and you still get the same story rush as you do when finishing a novel. I wish I could sit down and read for hours, but then I start hearing noises and thinking about stuff I have to do. Unless it’s a really fantastic book. I do most of my reading on the train, where the noise drowns everything out. I started my first book in the summer of 2007, which means I was 21. Before that, I’d read about two hundred books while working at a gas station, and I knew it was time to try writing my own stuff. I had the bug. That first novel didn’t pan out, but I started my first COMPLETE novel in the fall of 07, and finished it March 6th, 2008. Nothing will ever compare to finishing that first book, which was, unsurprisingly, a piece of garbage. Or a bag filled with garbage. That school doesn’t prepare you for life. You have to figure that stuff out on your own. Maybe that’s not a great thing, but it’s the most important thing. 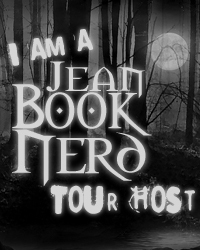 In your new book; The Planet Thieves, can you tell my Book Nerd Kids Community a little about it and why they should read your novel? The Planet Thieves is a story about a group of young cadets (ages 7 to 13, but the main characters are either 12 or 13) who are spending their required spacetime aboard a real ship during their summer quarter. The ship comes under attack by the Tremist, an alien race we’ve been at war with for sixty years. The cadets are told to hide, but are not told what to do once the entire crew is either captured or killed. Mason and his friends discover the ship they’re on—the SS Egypt—has been tasked with a special mission to transport a new weapon that will change the war forever. A weapon that has just been stolen by the Tremist. Now Mason has to lead the cadets in an assault to take back the ship, before the weapon is used against them. You should read it if you like nonstop action and adventure. Those are two things I can promise in this book. And planet thievery. For those who are unfamiliar with Mason, how would you introduce him? He is that smart kid who doesn’t like stupid rules. You remember those rules in school that were just plain dumb? If Mason doesn’t agree with something, he has a hard time doing it, which is not the right attitude to have when you’re training to be a soldier in the Earth Space Command. Above all, Mason believes in justice. Nothing gets under his skin more than when he sees someone treated unfairly. I would like to introduce Mason Stark to Peter Wiggin from Ender’s Game. He would beat the crap out of him since Ender never could. Jeff Somers and Sean Ferrell are two authors who I’ve learned so much from over the years, and who I am honored to call my friends. They’re older, like five hundred or something, so they have much wisdom to bestow upon me. I’ve also gotten to know Josh Bazell, who just happens to have written my favorite book of all time, Beat the Reaper (it’s not for young readers). We hang out sometimes, and we’re friends, but he too has taught me much about writing and being a decent human being. I consider all three of them mentors and great people. No matter what: No matter what: No matter what: Follow your dreams. If you don’t try, you will regret it. It is okay to fail. You will probably fail more than once. But if you love something and don’t do it with everything inside you, you’re living a lie. This is easy. I worked at EB Games before it became Gamestop. I love videogames, so it was a great job. What makes it the most memorable is I worked with my two best friends. Imagine working in a videogame store (if you like games) with your two best friends. I will never have as much fun as I did during that time. Ever. Dying before I have a chance to accomplish all the things I want to do in life. I have a fear of things like cancer. I’d rather get mauled by a tiger than get cancer. It blows my mind that the body can kill itself just because one cell went a little wonky. How does that happen? How do we not have a cure for it yet? Terrifies me. But I’m working on it. I want to get a tattoo of the bat symbol on my wrist. I think about Batman and I go: There’s a guy who fears nothing. He recognizes some things are not in his control. I want that reminder. I used to be terrified of flying, but now I realize that if the plane went down, there’s nothing I could really do about it. So why be scared? My greatest recent adventure was being an extra on the Avengers. I got a call one day and they said, “It says here you can film any time, can you be downtown in three hours?” I of course said yes. I spent 12 hours standing around with Stellan Skarsgard, Jeremy Renner, and Tom Hiddleston. I’m a Whedon fanboy, so to stand a foot away while Joss Whedon gave direction to Loki is something I’ll remember for the rest of my life. I basically walked around in a daze, not believing I was really on a movie set, much less the mother fathering AVENGERS. It is still the greatest day of my life. Today. I try to not say it too much though. When it’s an automatic response, it kind of dilutes the meaning behind it, don’t you think? I guess it depends on what kind of bad day it is. I usually just keep it bottled up inside so I don’t burden anyone with my problems. February. But it had been a few years before that. Isn’t crying weird? I’m primarily on twitter when I’m supposed to be writing (@DanKrokos). I like answering questions on my tumblr, too (dankrokos.tumblr.com). I have a facebook page but I never use it, because yuck. Mason Stark is a cadet for Earth Space Command and is on board the USS Egypt. Along with seventeen of his fellow cadets, they thought their upcoming voyage was going to be as monotonous as can be. It all changes when they are attacked by an alien race called the Tremist. They have targeted humans as their enemy for the last sixty years. Not knowing what has happened to the USS Egypt’s crew, it is up to Mason and his fellow cadets to notify the ESC. After learning why the USS Egypt was attacked, Mason is determined to lead the cadets on a mission to take back control of the ship. Dan Krokos’ The Planet Thieves is an electrifying adventure that will grab your attention immediately and immerse you to an exhilarating ride through space. Nothing captures the imagination of young readers like an adventure in space travel. Throw in some action, mystery, danger, and aliens, it is the perfect recipe that will engage readers. The substantial dangers that the characters face will have readers on the edge of their seats. 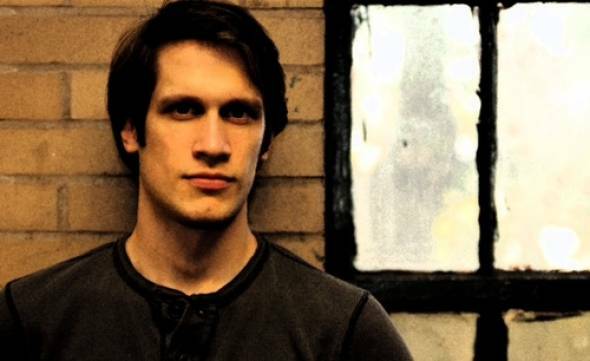 Mason is the type of lead character that will have the support of readers from the beginning. He’s strong and brave and it’s something that young readers can relate to as they are attributes that they all want to possess. As with any middle grade book, the foundation is built upon a grand adventure that is action-packed. Mr. Krokos wastes no time in giving readers a story filled with unique ideas that will amuse from beginning to end. Although it is intended for middle-graders, I appreciate his writing approach. It definitely has that adventure only a middle-grade book can bring, but the quality of it could be categorized for readers that are much older. Thank you Dan and Tor for making this giveaway possible. 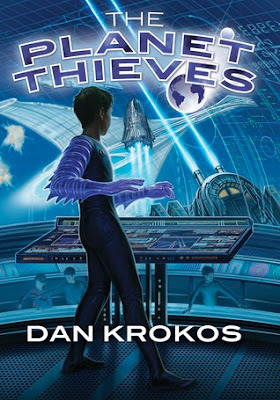 1 Winner will receive a Copy of The Planet Thieves by Dan Krokos. This book sounds like a lot of fun! I can't wait to read it!